Chlorine Dioxide Sachets - Shengya Chemical Co., Ltd.
SY–Sachet 20G: Treat up to 20 to 40 ft2 of space for 1 months. SY–Sachet 40G: Treat up to 40 to 80 ft2 of space for 1 months. 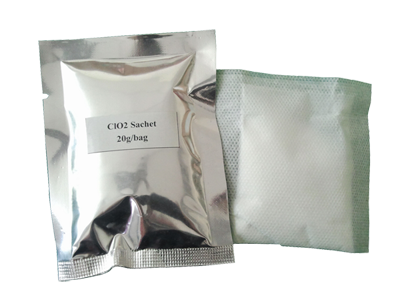 1.SY–Sachet is a chlorine dioxide gas release pouch. 2.The specific powders are impregnated in the sachets. 3.When exposed to moisture in the air, the sachets produce chlorine dioxide gas to destroy unpleasant and unwanted odors at their source. 4.This unique capability of SY–Sachet enables the expanded use of the powerful biocide in a wide variety of applications that previously were impractical. Character: Chlorine dioxide begins to work immediately upon sachets exposure to ambient water vapor, selectively seeking out and destroying unpleasant and unwanted odors at their source. Unlike conventional deodorizers, which absorb or cover up odors with fragrances, SY–Sachet deodorize effectively by oxidizing such compounds as animal and human wastes, hydrogen sulfide (rotten egg odor), mercaptans, organic amines, and odors produced by mold, mildew, tobacco smoke, and spoiled food. The user simply opens the package, hangs, places or adheres the sachet in the area to be deodorized, and the unwanted odor disappears. DO NOT OPEN INNER SACHET!! !